When it comes to the order entry process, from receiving a customer's order to delivery, the clock is ticking and time is money. The entrée system delivers on all fronts, providing a food distributor with all the information needed to quickly enter a customer's order, easily make changes and track add-ons, while recording all the activity made to an order by your users so you have full in-house accountability. 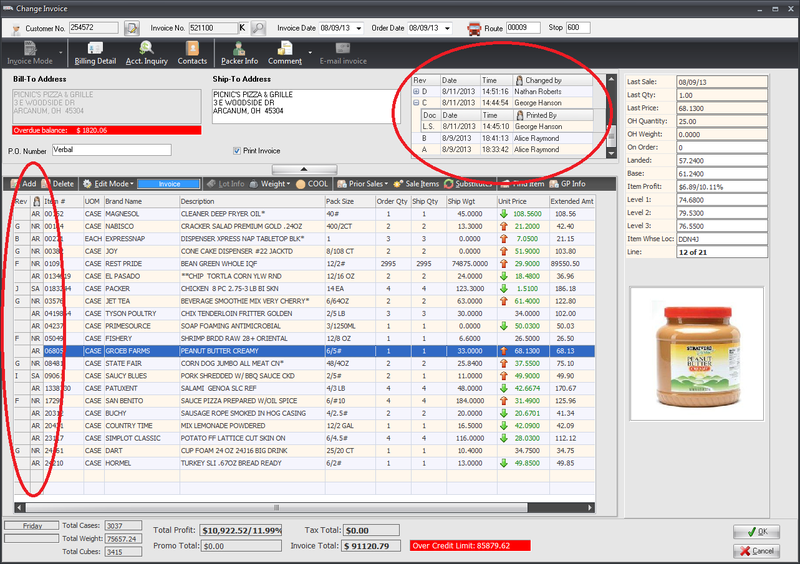 Everything from price indicator arrows showing if a customer's price has gone up or down, to full details about each item, to accessing a complete history of a customers buying habits including last purchase dates, quantities and pricing, to recommending substitutions and tracking backorders is included. The Invoicing process in entrée has been fine tuned for almost 25 years from the feedback of over 1,500 food distributors using our software. That's because some of the best minds in the food distribution business, our customers, have provided suggestions and insights to streamline this critical process. Whether you choose to begin the order entry process with a traditional Sales Order or you utilize only the Invoice process, you'll quickly come to appreciate entrée's power and ease of use. The Invoicing process normally begins with the Order Taker Call List feature. This is a useful tool your order entry staff can use to both ensure they make all of their daily calls and to keep track of the order status for each of their customers. The information which appears here is linked to the user that has logged into entrée or can easily be switched to another user. Each customer can be assigned an in-house order taker, along with the days of the week and times they should be called for their order. If preferred, the entrée system can also generate different styles of Call List reports which can provide this same information along with a listing of all the items the customer normally purchases. These reports can be printed, emailed or faxed. 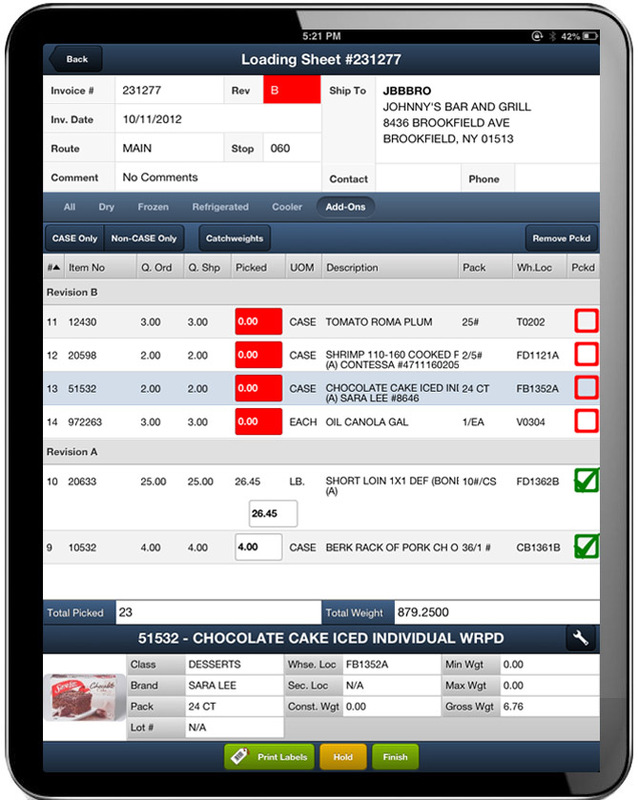 The Standard Order feature was designed to allow orders to be entered quickly, properly and efficiently. While invoicing, this screen will display each of the items the customer regularly purchases and allow the user to quickly enter the quantity requested. Note that as each item is displayed, key information about that customers last purchase are shown, including last sale quantity, date and price. You can even set the order in which items appear, in case your customer prefers to order items in a specific sequence. Even though your customers may quickly place phone orders, many entrée users can easily keep up the pace because of the simple and elegant design. But most notable of all is the primary goal of this feature, which is to help your order entry staff sell more items while preventing customer call backs with add-ons to their order. This is accomplished because the order entry person can quickly determine any items that are being skipped. This provides the opportunity to ask the customer about those skipped items. The bottom line is that you will sell more items and at the same time improve relations with your customers because they'll realize you care enough to know and remember what they order. When entering a customer’s order, sometimes it is vital to have immediate access to their complete buying history. Clicking on the "Prior Sales" button will give your order entry staff and DSR’s complete access to a customer’s MTD Sales, YTD Sales and Last Invoice. Selecting "Last Invoice" allows you to quickly look at the last invoice of the ship to customer. In addition to the last invoice, you may view any of the ship to customer's invoices, even invoices that have been already moved to history. 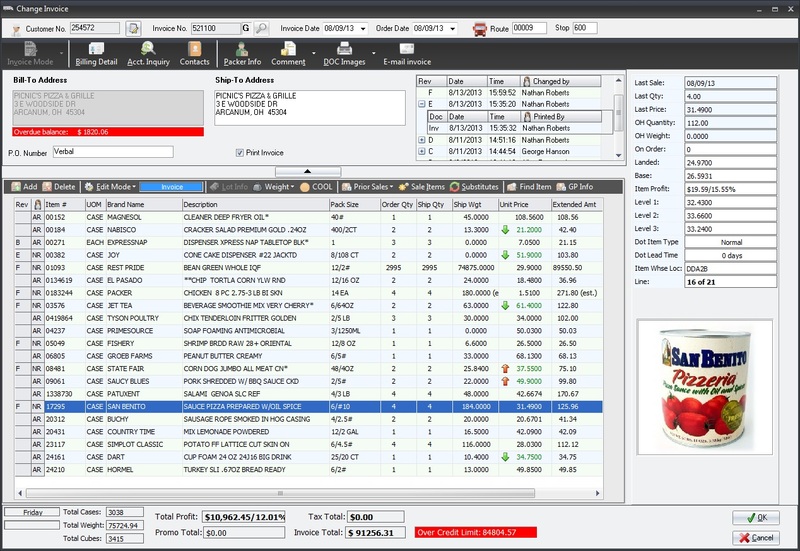 Prior Sales information can be sorted by Invoice Number, Invoice date, Item Number and Description column headings on the screen. For example, if you wanted to quickly see all of a customer’s "mozzarella cheese" purchases, just type "mozz" and they will instantly appear on the screen along with the dates they purchased, unit price, quantity, etc. You can also select the item and it will be transferred onto the customer’s order. In the fast paced world of a food distributor, sometimes more than one person is involved with the entry, editing and printing of a customer's order. Then when there are issues with an order, it is helpful to see exactly who was involved and when as well as exactly what they did. The entrée system will track each user that makes changes to each line item on a customer's order along with the date and time that the change was made. It also tracks the printing of Loading Sheets and Invoices. As many users of the entrée system deal with meat, poultry, cheese and seafood, it will come as no surprise that catch weights are fully supported. The entrée system completely automates the catch weight entry process, even spotting errors if an individual catch weight is greater than its defined 'maximum weight' or less than its defined 'minimum weight'. Note that the system can generate a Loading Sheet which will draw the proper number of lines beneath each catch weight item for your warehouse personnel to write down each weight. Later, when the invoice prints, besides printing the total weight, the system can print each catch weight. Of interest to many distributors wishing to save time and make their order picking process even faster, more accurate, as well as saving time for your office staff, is our Electronic Warehouse Manager Android application. It runs on reasonably priced Android tablets with Bluetooth based laser barcode scanners. It automates the process of collecting catch weights. With this system if your catch weight items have barcodes, the Electronic Warehouse Manager will scan the weights directly off the case along with other important information. This eliminates the need for your warehouse pickers to write down weights and also frees up your office staff from manually entering each weight. To learn more about the Electronic Warehouse Manager, click here. As products are scanned during the picking process with EWM – Electronic Warehouse Manager (or other integrated scanning systems that work with entrée), the entrée system will save and provide you with full visibility of the all the key fields encoded on the barcode label. This visibility is for each scanned barcode, so if the customer ordered 10 CASE’s of a specific item, each of the 10 CASE’s scanned barcode label data is saved and can be viewed and reported on. 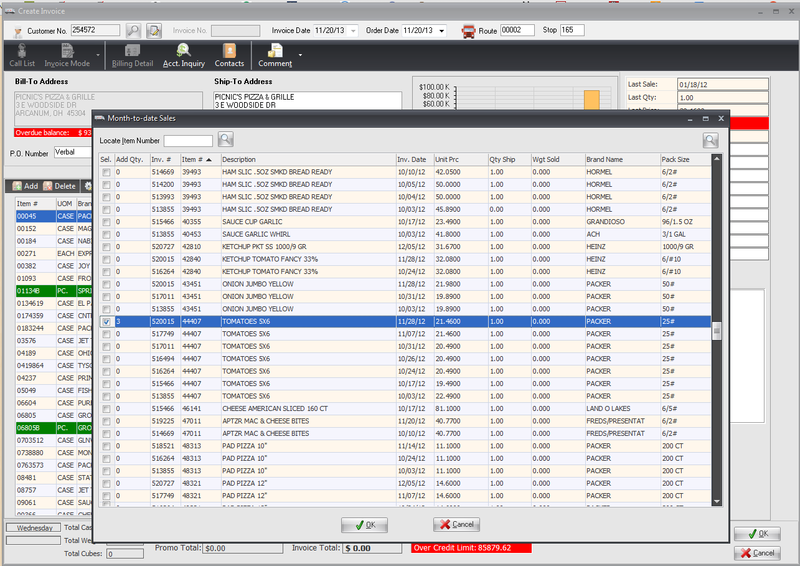 The screen shot below is from the "Change/View Invoice" option in entrée and illustrates one area of scanned data visibility. 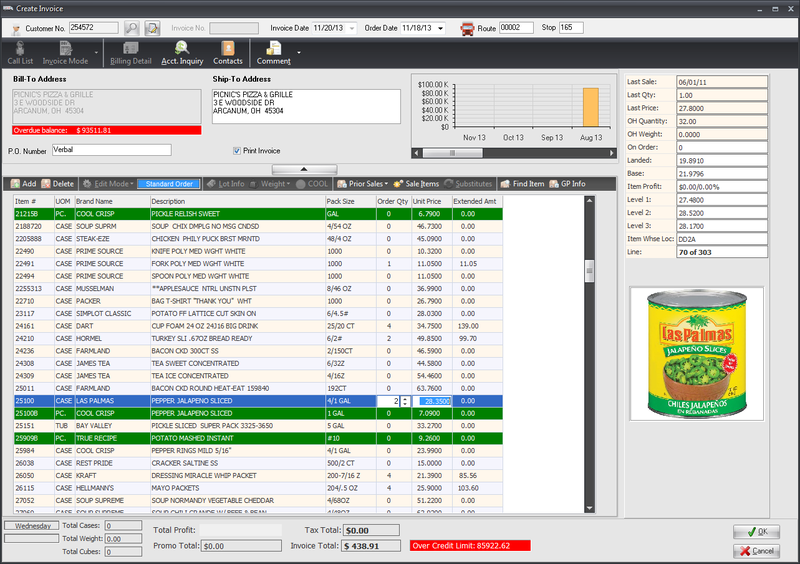 When a line item is highlighted in "Change/View Invoice", the information panel on the right will display the scanned data per label including who it was scanned by, the date/time of the scan, the Lot Number, Expiration Date, Serial Number, Production Date, Packaging Date, Sell by Date and Weight of the item. One of your biggest challenges during the invoicing and warehouse picking process is managing customer add-on's to invoices. 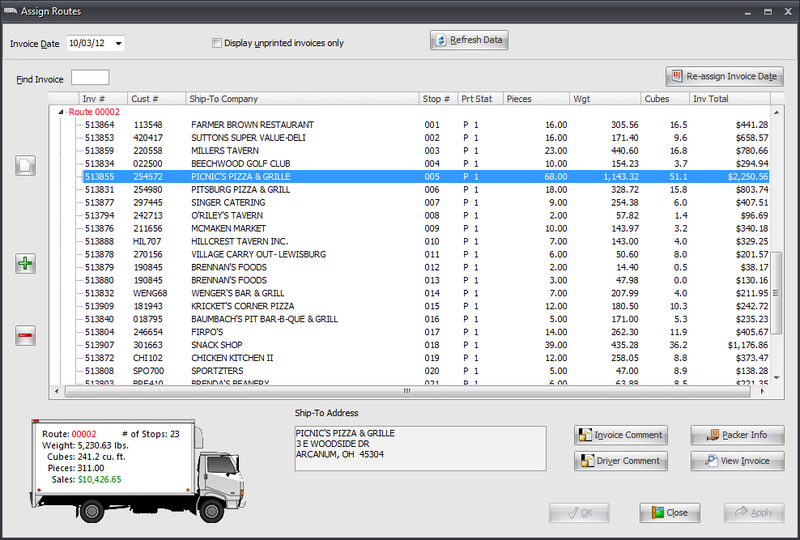 Because the entrée software allows you to easily revise a customer invoice, including adding last minute customer requests for additional items, this can cause picking confusion in your warehouse if the order has already been picked. Note that each time a customer's invoice is revised, entrée will attach a "revision letter" next to the invoice number. For example, if invoice number 234561 was revised twice with multiple items added, the invoice number will be appear as 234561B. The B is simply a code to show that it was revised two times, C would indicate three times, etc. Pickers may not realize that the add-on's have already been picked, causing double picking errors which waste precious time and resources. The above problems can be compounded when multiple item add-on's and revisions are made. To address and solve this issue, your printed Loading Sheets can show customer add-on's separately. 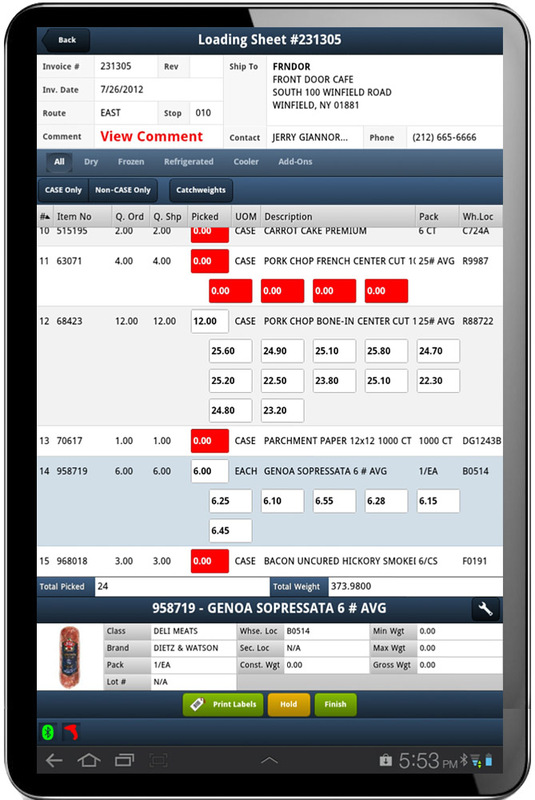 Also, the Electronic Warehouse Manager Android app includes an Add-On's filter so that your pickers will clearly see what items were added to each revision of the invoice and if those items have been picked. This filter is the perfect tool to keep your picking processes working flawlessly when dealing with last minute item add-on's to existing invoices. To learn more about the Electronic Warehouse Manager, click here. The ability to easily route your trucks each day is critical to the smooth and efficient operation of your food distribution operation. However, routing trucks is not an exact science. Certain customers may have emergencies that require your driver to stop there first, or road conditions may dictate a change in plans. Although entrée provides interfaces into third party routing and fleet management software platforms for automatic and advanced features, a basic route assignment process is built in. This Assign Routes feature allows you to easily re-assign invoices to different routes, while you can monitor the weight and cubes required for each truck. Note also that because route assignments are so important, the majority of reports in entrée allow grouping and sorting by route. This includes Loading Sheets, Pick Lists, Pull Sheets, Delivery Manifests, Invoice Registers, etc. The dashboards built into entrée provide you with important business intelligence, with order entry and invoicing being important features. 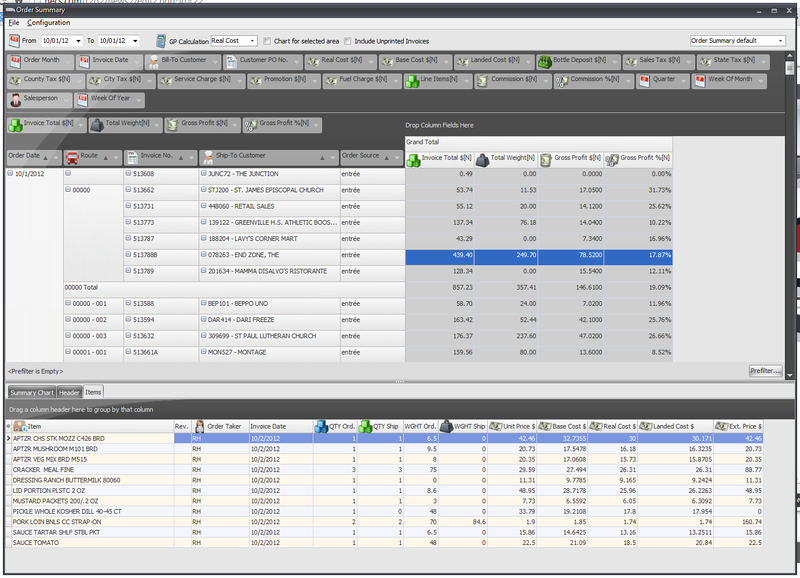 For example, the Order Summary dashboard provides a highly customizable view into the orders placed for a specific time period with drill downs available to the line item level. 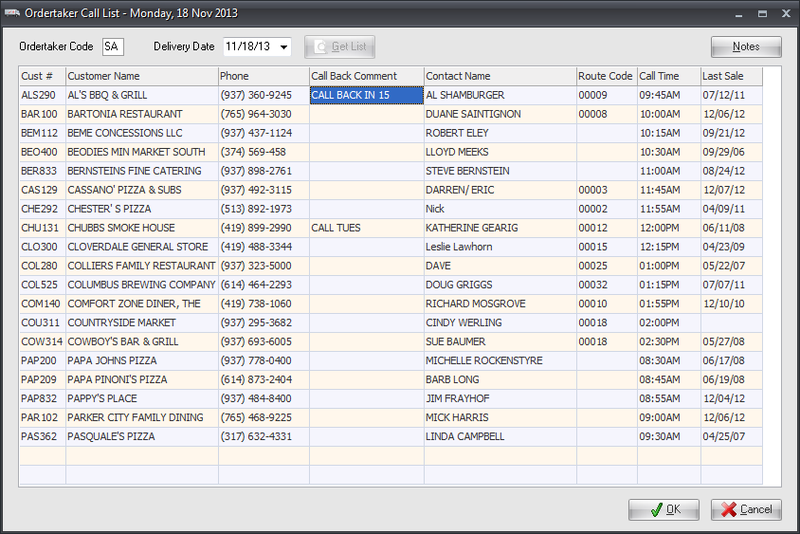 This dashboard will be one of many you will come to depend on to provide you important customer order information. Other related dashboards include Customer Sales, Returns, Backorders, Short Ships, Daily Delivery Summary, Top Customers, Top Items, Top Salespeople, Top Brands, Top Classes, Top Routes and Top Order Takers.